The island of St. John in the Caribbean Sea is both paradise and a sanctuary for grooms and brides looking to get hitched — or re-hitched — on the beach. GroomGroove.com sought out St. John’s Barefoot Minister, Anne Marie Porter, for some ideas on how to make your destination beach wedding a reality in the U.S. Virgin Islands. 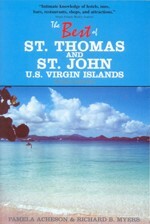 St. John in the U.S. Virgin Islands. St. John is a Caribbean island that forms part of the U.S. Virgin Islands, a small slice of the United States just east of Puerto Rico. 3/4 of the island is designated as a National Park and is therefore completely undeveloped. With crystal clear water and some of the top rated beaches in the Caribbean, the U.S. Virgin Islands is an ideal place for a destination beach wedding. 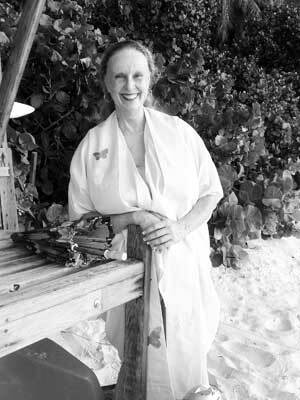 If her voice is any indication, the sun is certainly shining on Anne Marie Porter, a well-known professional wedding officiate, and a twenty-five year resident on the U.S. Virgin Islands. With pale sands and the ocean as your altar, grooms and brides can be married by Porter in a personalized ceremony for only $400. Included in this price tag are all consultations, a ceremony at the location of your choice, and a certified copy of the license and certificate of marriage. (A separate $100 fee will need to be paid to the court for your marriage license.) This is quite a bargain, given that you are looking at a minimum of that amount, if not more, for licensing and officiate fees in other parts of the world that are much less beach-friendly! “I have no paper in my hands,” Porter says proudly. “I create each ceremony based on the couple’s individual needs.” For this reason, many interfaith couples choose St John Weddings. The barefoot minister reports that she performs many “spiritual ceremonies,” in addition to religious ceremonies. She often brings the ceremony “back to nature,” describing the environment surrounding the couple as they make their commitment to each other. “Year-round,” reports Anne Marie Porter, simply. “Year-round, St. John is 87 degrees and sunny. Rain showers are short, and usually followed by a rainbow.” And, repeat after us: “Hurricanes hardly ever happen.” Porter informs GroomGroove.com that although September is officially on the books as “hurricane season” in her world, a true hurricane hasn’t hit St. John in over a decade, which is why it might be wisest to plan your wedding in the off-season — roughly July through October. Booking flights and hotels for the quieter months may save you money on flights and accommodations — well-worth a little research. “But the beaches are just as lovely and the restaurants just as wonderful in the off-season” assures Porter. If you’re looking for the destination wedding experience, but don’t feel like saying your vows barefoot, St. John Weddings also offers wedding ceremonies in villas, sailboats, sugar mill ruins, and island churches. And if you’ve chosen St. John Weddings, chances are your wedding and honeymoon destinations are one and the same. 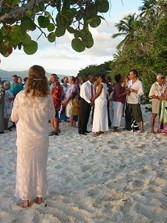 Also a popular choice for St. John Weddings is vow renewal. “Grooms often call me and say that they want to surprise their wives with a vow renewal on the beach,” reports Porter. 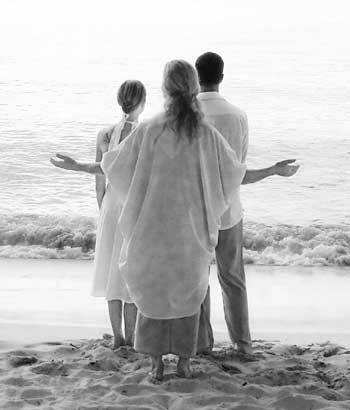 Under the guise of a vacation, husbands can turn a family or romantic couple’s getaway into an excuse to marry their wives all over again on the beach. Of course, you’ll need to budget for air travel to The Islands unless you’re a very fortunate resident of the Caribbean already. Delta and American Airlines can get you some of the most affordable flights with short stop-offs in either Florida or Puerto Rico from many destinations in North America. “Swimming, snorkeling, fine dining, scuba diving, sightseeing — it’s all there. Marriages, re-marriages, elopements, and vow renewals are all performed by Porter on a regular basis. St. John’s Weddings also has access to top photographers and videographers, florists, and musicians. You will need to do the legwork and write the checks for these extra services yourselves, but Porter will provide the names, numbers, and websites of companies gladly, and free of charge. “Anne Marie Weddings.com, a wedding planner on St John, provides a lovely service. Since 2003, hundreds of couples have renewed their wedding vows in what has become a cherished tradition on St. John. The V.I. 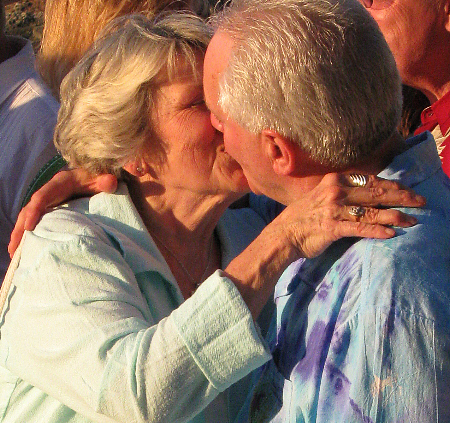 Vow renewal was started by Bill and Cathy Dove who were celebrating their own 30th wedding anniversary. The couple thought it would be great to renew their vows for the occasion. Cathy asked her friend, popular wedding officiant Anne Marie Porter, to do the honors. Besides Valentine’s Day, Porter marries couples all year long. In her 12-year career, Porter estimates that she has officiated for about 3,000 weddings and vow renewals – as many as five a day – and she still gets excited about each one. 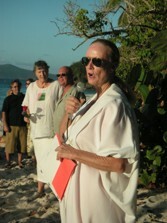 Anne Marie Porter is one of the reasons St. John is known widely as Love City. Over the past ten years, she has become the go-to girl for performing wedding ceremonies on-island, and it is due in large part to her efforts that St. John has blossomed into a major wedding destination. For those who have attended ceremonies she’s performed, it’s easy to see why she’s so sought-after.With the perfect blend of sincerity, solemnity, humor, and reverence, she helps usher couples into the horizon of their new lives together. Clearly, she loves her chosen vocation (which she would refer to as her “blessing”). I recently attended the wedding of a lovely local couple way out on East End that Anne Marie officiated. Adorned in her signature white butterfly stole, she spoke to my friends as though they were her old friends, spreading her arms wide to symbolically envelop the new union, a smile on her face, her mellifluous voice alternating between addressing those gathered in witness, and lowering to a more intimate volume to share words with the couple alone. When it comes to Anne Marie and St. John, the island that she has called home since 1979, it’s difficult to imagine one without the other. She seems perfectly suited to St. John as if one cannot tell whether the island-shaped the woman or the other way around. After speaking with Anne Marie on this topic, it seems clear that each has found a perfect fit in one another. As we arranged ourselves on a picnic table at the pavilion at Trunk Bay, deserted as the late afternoon shadows called beachgoers on to other adventures, we fell into a conversation about the importance of learning to focus on the present, of, what Ram Dass termed, being here now. St. John seems to be a good place in which to live this way. There are a lot of pretty zen folks here. After all, aren’t we “all here ‘cuz we’re not all there?” St. John is one of the few remaining Western havens for dharma bums. Although I doubt Anne Marie would refer to herself by such Kerouakian standards, she is most certainly zen. Serene and open, she embodies this landscape of clear blue water, lush green hills, white sand. Soon, Anne Marie stepped off the ferry and onto the St. John dock, at the time “just a little cement ramp with a tiny wooden customs shack up on stilts. The park in Cruz Bay was just a grassy knoll.” Many people would have taken a tour, appreciated the place for an afternoon, and continued on with their laid plans. Anne Marie did not. Though she may not have been looking for a home, Anne Marie found one on that day in November. She instructed the cabbie to “take me to the least expensive place to stay,” and he dropped her off at Maho Bay Campground. She rented a tent for a week and returned to St. Thomas to bid bon voyage to her friends. “And then, obviously, I had to go back and tell my friends that I wouldn’t be going with them. So, they took off and I came back here,” she says, matter-of-factly. A little stunned, my first response is to ask her if she was scared. “No,” came her instantaneous reply, “I’d also moved to Connecticut, where I didn’t know a soul, so I’d had a sense of…I don’t know…adventure. No fear leaving North Carolina, no fear leaving Connecticut, no fear staying on St. John.” And just like that, she changed her entire life and adopted a little speck on the edge of the Caribbean sea as her home. 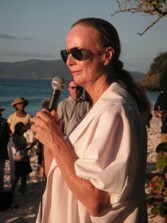 Her talents have won her a lot of good publicity, which has fueled the ascendance of St. John as a wedding destination. Anne Marie pulls a book from her satchel and flips it open to show me a page with two facing pictures. The first shows her marrying a smiling couple on the beach. The photo next to it captures her with the same couple, still smiling, still on the beach, a few years older and holding their first-born child who has just been baptized. “And since then, I’ve baptized their second child,” she says with a proud, happy laugh. We gaze up at the rustling trees as the afternoon light warms our skin and the sound of the waves soothes our ears, and I understand exactly what she means. St. John isn’t always perfect, but it’s terrifically close; our physical location doesn’t change our past experiences or heal our wounds, but if we chose the right place it can help change our outlook and facilitate our growth. Look around, and tell me you don’t feel lucky. A quick glance at her cell phone tells her that it’s nearly time to meet up with the couple she will be marrying on the beach that evening, and she dashes off, parasol in hand, to greet them. I follow closely on her heels and we introduce ourselves to Sean and Jessica, a beautiful couple dressed with simple elegance for their quiet nuptials. Anne Marie immediately makes them feel at ease, chatting with them about Trunk Bay, asking them questions, and smiling at them as she leads them down the beach and into their new life together. I am the sole witness to the intimate ceremony and act as an impromptu wedding photographer. I’ve never attended a service Anne Marie has performed without getting teary, and this one is no exception. You can always feel the sincerity in her words, and the beauty of what the ceremony means is always immediate. As I look on, she faces the couple toward the water. Their forms are lit by the sinking sun as it paints the waves orange and pink. As she speaks, Anne Marie raises her arms behind them. Lightly touching their backs, she connects and envelops them as they gaze out over the endless water, looking out on their future, full of love. Feb. 14, 2009 — “Today when you say ‘I do,'” said the minister, “it’s with a lot more information.” St. John snowbirds John and Barbara Achzet got the honors for being married the longest — 61 years — at the 7th annual Valentine’s Day vow renewal ceremony at Trunk Bay Beach. Daily News Photo by Nick Schneeman. Jack and Barbara Yellen and Arthur and Judi Rosenthal pour champagne after renewing their vows. For the sixth year in a row, Trunk Bay hosted a poignant “Celebration of Love” vow renewal ceremony at sunset. The event is organized annually by the Dove family and presided over by the Rev. Anne Marie Porter as a way to honor the commitment, sacrifice, and beauty that marriages entail. Greg, who lives in Maryland, said he was inspired by his parents’ marital philosophy: sharing. “You’re in it together and you do things as a team,” he said. The younger couple said their goal wasn’t necessarily to match the elder Barlows in length of the marriage, however – to accomplish that, they would have to live to be 105. Judi and Arthur remembered how they had met and dated in eighth grade when they both had braces. “Everyone was afraid we would hook them together,” he said. And Barbara and Jack had decided to get married on their second date. Last year 100 couple renewed their vows. Over those six years, 550 couples have participated, representing more than 8,000 years of marriage. 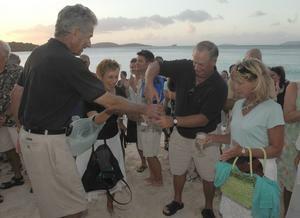 The couples are welcomed as they approach Trunk Bay Beach by Michael Banzhaf playing the flute. Lee Morris and Livy Hitchcock will serenade them as they reach the beach. 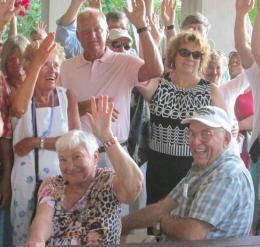 Another St. John snowbird couples, Nan and Bob Barlow, are right behind the Achzets: They’ve celebrated 57 wedding anniversaries. 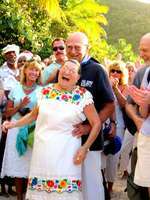 Wearing a Mayan wedding dress she bought on a trip to the Yucatan back in 1972, Barbara said she wouldn’t know what to do without her husband by her side. While the ceremony brought out lots of vacationers, many local residents also renewed their vows.